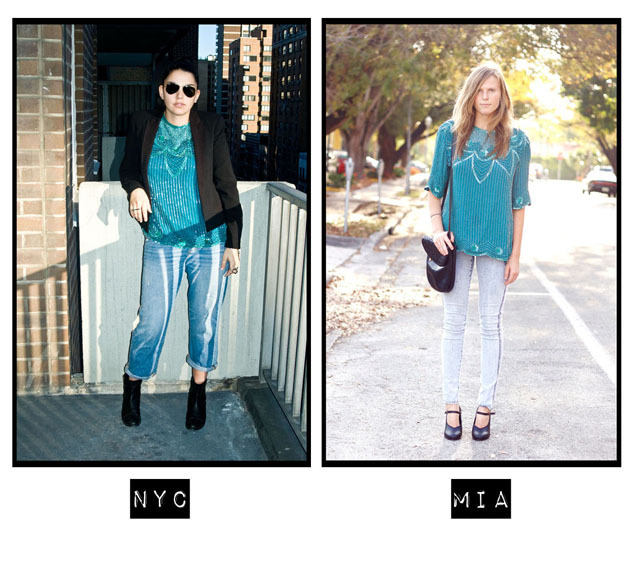 Collections: Shirt Swap with Steffy... From MIA to NYC! One of my absolute favorite things about blogging is meeting new people. One of the first bloggers I met was Steffy from Steffy's Pros and Cons. I love her sense of style and the way she is able to mix and match all her gorgeous thrift items. 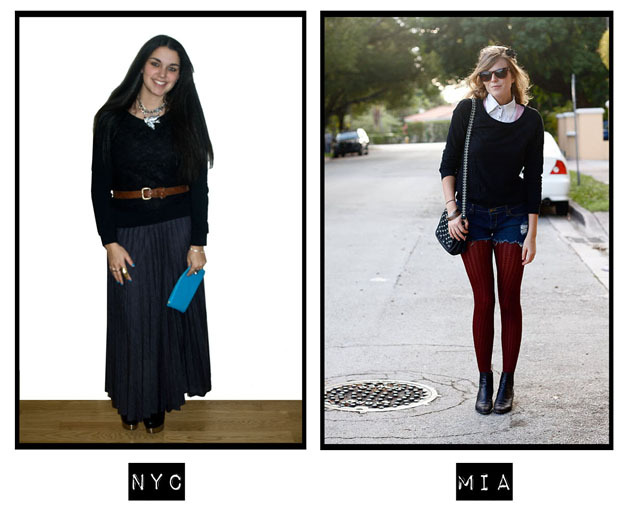 We started talking and thought it would be a great idea to swap an item we've styled before on our blogs and show NYC style vs. MIA style. Steffy sent me this great black lace sweatshirt. I styled it with my floor length Zara skirt (I know I'm long skirt obsessed) and tons of accessories. This great blue clutch I absolutely adore. When I first got it I wasn't sure how I felt about the particular shade of blue but after wearing it, I can safely say I love it. Does anyone else realize how every blogger now takes a picture like this (see above) whenever they're wearing a long skirt? I just had to do it people! And I must admit it was tons of fun. The BF found it hysterical. I love Steffy's tights and boots here. I'm a huge, huge fan of tights with jean shorts. And that burgundy color, gorgeous. 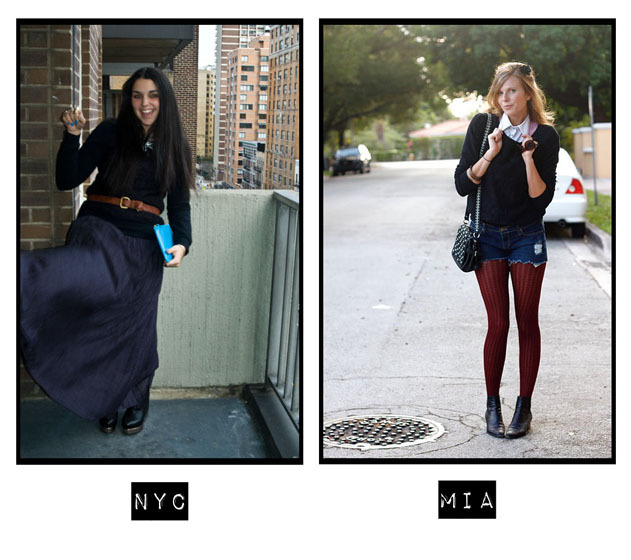 The funniest part to me about these comparisons (aside from my gorgeous facial expression here) is the difference in weather between MIA and NYC. I mean it's just freaking ridiculous. Steffy's pics are so gorgeous and filled with sunlight and mine are barely lit because its overcast. Gotta love that NYC weather! And did you notice the difference in background? Steffy's pictures you can see trees and green, in mine you see a dirty balcony and buildings haha. Ah the city life. 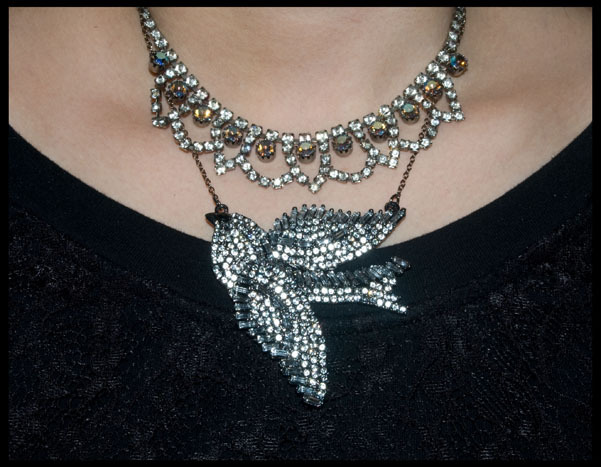 This last comparison is the piece I sent to Steffy, my green beaded top. Hop on over to Steffy's blog to check out her post on our swap! This was an amazing experience and I think we'll be making this a monthly thing... so keep an eye out for more of these posts in the future! Guys, can you believe it's Monday again? I'm in shock. Tonight was a double dose of Brothers and Sisters which was awesome but alas I have to work tomorrow. If you haven't already, don't forget to enter my Shopbop GIVEAWAY! What a fun concept. You guys did wonderful styling these pieces in your own way. Your hair is so long and pretty! I can't wait to see more! i love this post. so much fun seeing how differently you two styled each piece. i'm an avid reader of you and steffy so it was interesting on a higher level for me. very cool. shocked by how long you hair is. i'm one to talk because i rock the bun 80% of the time, but you have GOT to wear your hair down more often. it's fantastic! That maxi skirt is GORGEOUS on you. I am so jealous of everyone that can pull them off! I just think they look so chic and pretty on everyone! the colour of your clutch is amazing. this post was so fun you watch ! LOVED the pictured all of them ! If you have time please check my blog out ! thanks ! love the long skirt! its beautiful. What a great post! And you both look so good in that black sweater! haha such a cool idea! 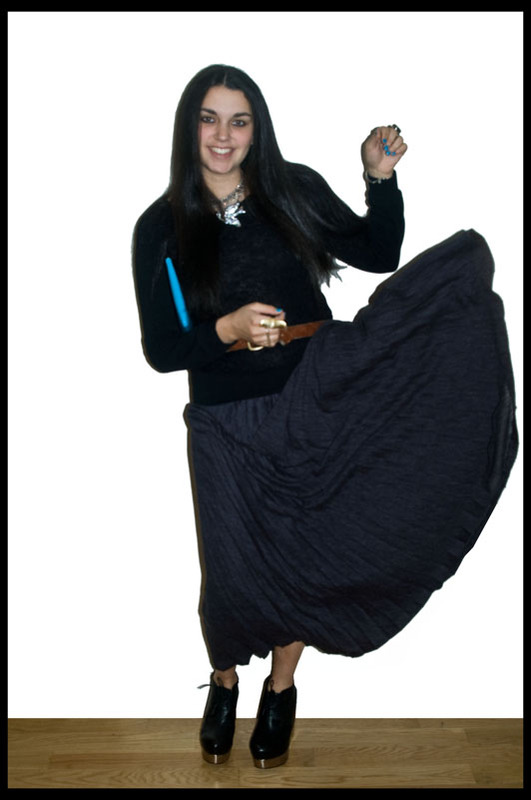 Love your shoes and skirt! Stunning! love the idea and your skirt and clutch are soo fab! Swapping things with Steffy was a great idea! She always wears the cutest little vintage-ish outfits love her style! And spreaking of love I can totally see why you love long skirts, cause you look great in them! Also, I tried to enter for the giveaway, hopefully my comment got posted! I love the way you wore the top. 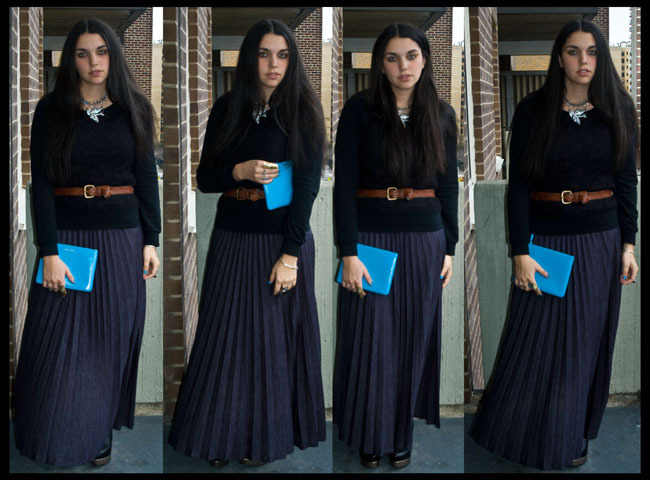 Obsessed with maxi skirts and that one is gorgeous. PS, love the long hair! Oh I love this idea so much!!! It's really refreshing to see how different people style one particular item that can look so different depending on how it's combined. You both look great in both items. Your skirt, your clutch... just perfect!! And love the happy photos! First, I can sense that you've got great taste and style. These pictures look superb! I'm glad I found your blog. 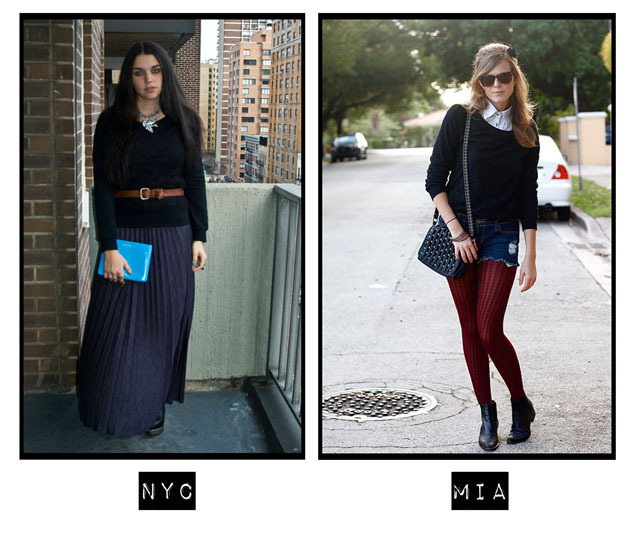 I love the long, pleated skirt...something I definitely want right now! AMAZING! 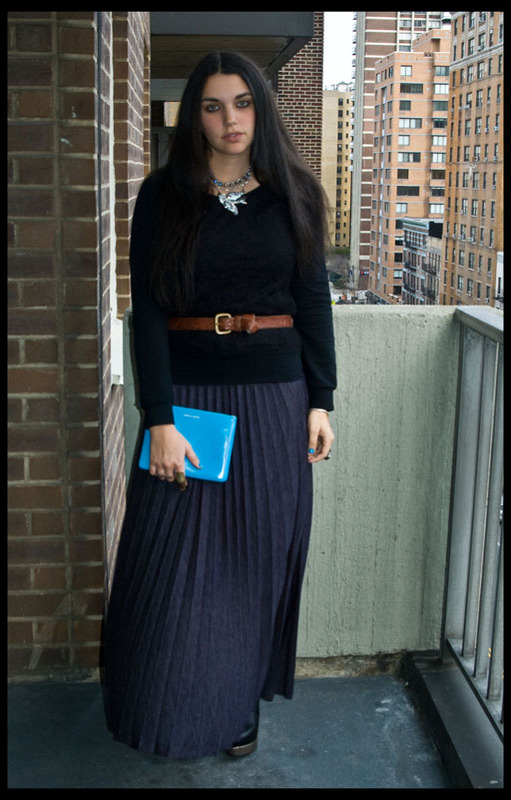 Great post dear, I adore that maxi dress outfit! Love your Jeffery Campbell booties. And I love your skirt throwing pose :) hilarious. this exchange is a great idea. We do swap not shop...get altogether and we exchange clothes! obviously I love me a GDG clutch. duh. wow, I love your look! The clutch is so adorable! great colour! Love the looks. you guys both did a great job. 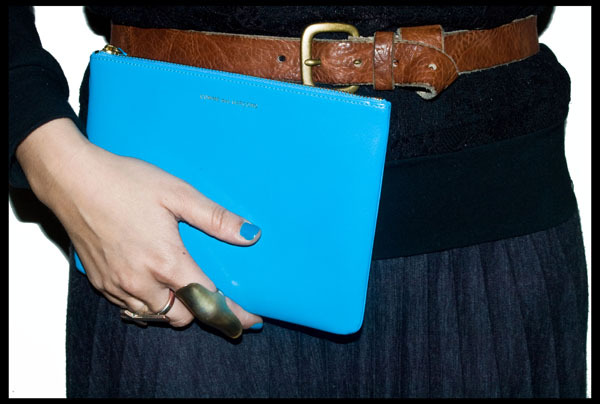 that blue clutch is fantastic! I love that you guys share clothes! Such great interpretations-- that green top is fab!! love your outfit and those shoes are amazing! thanks for the comments will check out the giveaway! The long dress is very trendy for this summer, the dresses which you present on your blog are nice. I like to read to you. Goodbye on our respective blogs I hope. Awesome pictures!! Keep smiling! You look great! Your look is lovely <3. That pleated plum skirt! feeling a lil goth vibe there and I love it. Sorry for getting back to you so late, haven't really kept on top of the bloglovin!! lovelovelove how you put the maxi skirt. Miraculous pictures! Wonderful shoes! You look great! I love that skirt, I would like to wear them, but they don't fit me well, DAMN!